There are two ethnicities of food Nate loves: Indian and anything Mediterranean. When he was single and working ridiculously long hours in the oil patch, he ordered take out shawarma three times a night from a local restaurant here in Grande Prairie. And if you mention falafel to him, he will start drooling at the mouth. This guy has such a soft spot for ethnic food. I've made my homemade butter chicken (which I adore....or used to) at least a dozen times in the 2 years since moving here. Needless to say, I'm on strike from making that now as I've lost my appetite for it due to the copious amounts of time Nate has asked me to make it. Nate is not thrilled about this (heaven forbid he makes his OWN!) so for now, I'm happy taking this pregnant pause. 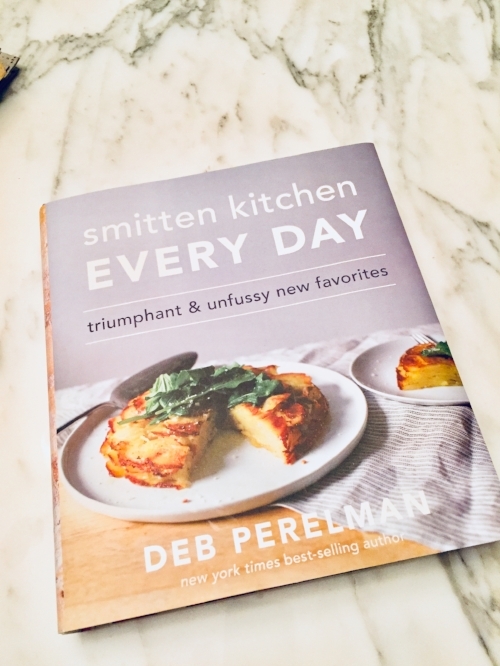 So, when Smitten Kitchen's Deb Perelman recently came out with her new cookbook, I immediately went to my fabulous new library to see if they had it. Well they did, but I had to wait. Turns out, I was 16 people deep on a waitlist to get it. Ugh. But Worth. The. Wait. I love Smitten Kitchen and her blog. Her first cookbook is one that I come back to often, at least twice a month, so I was excited to see what her new book would have in it. Nathan immediately stopped at the page that read "chicken and rice, street cart style". Go figure. Old habits die hard. He was like "we're making that". (Let me just preface this by saying, when Nate says "we're" making this, he really means "you're going to make this for me". It's like he lost all ability to cook in the kitchen or I've spoiled him since moving in. Either way, I was on the hook). Two months later, I bought the book (on sale, naturally). So I did make it and I have to say, it has slowly become one of our favourite new recipes in the book to cook. The flavours are simply divine - tasty yet so simple. There is magic that happens when you mix crushed coriander seeds, turmeric, cumin, garlic, oregano, smoked paprika and chicken stock. It's a meal that can be made ahead, and one that can be served hot or cold. It's healthy and can be eaten with pita or mixed as a salad. And if you have a crowd coming over, it's perfect! Cook it, dump all the portions onto a big platter and your guests will be happy...and full. Versatility is key here! Marinate the chicken. Combine the ingredients for the marinade, pour into a large ziplock bag. Add the chicken, seal and slosh it around so that it coats evenly. Let the chicken marinade in the fridge for 30 minutes or up to 2 days (I found that a full 10-ish hours is perfect). Second, make the sauce, combining all the ingredients in a medium bowl. Adjust seasoning to taste. I find making this ahead to refrigerate blends the flavours together better. Cook the chicken. Heat a large, deep skillet with a lid over medium-high heat. Coat lightly with olive or veggie oil. Arrange the cutlets in one layer and do not move them until they're brown and don't want to stick anymore, 5-8 minutes. Flip, and brown well on the second side, which will take 4-5 minutes (if you're using chicken breasts, you will need to cook for longer as they are thicker or you can also tenderize them). Make the rice. Add 1 tbsp olive oil to the pan, and heat it, then add the spices and rice and toast together for a minute, stirring. Add the stock and salt, and bring to a simmer; then reduce the heat to low, cover with a lid and let cook for about 15 minutes, until the water has absorbed and the rice is tender. Let it rest for 3-5 minutes (unless you're making ahead). Scoop half of it onto a serving platter. Combine the lettuce, tomatoes and onion in a large bowl to make the salad. Season with salt and pepper. The sauce will be your dressings. Stir the hot sauce and harissa together to make your hot sauce. To finish, chop the chicken into bite-sized, uneven pieces, then place the chopped chicken on the platter. Pile the salad in the remaining part of the platter. Dress the dish with sauce, to taste, garnish with cilantro. Serve with halved pitas.